A much-needed and hard-hitting plan, from one of the great Democratic minds of our time, to reform America��s broken health-care system. Undoubtedly, the biggest domestic policy issue in the coming years will be America��s health-care system.? Millions of Americans go without medical care because they can��t afford it, and many others are mired in debt because they can��t pay their medical bills. It��s hard to think of another public policy problem that has lingered unaddressed for so long. ?Why have we failed to solve a problem that is such a high priority for so many citizens? ????? Former Senate Majority Leader Tom Daschle believes the problem is rooted in the complexity of the health-care issue and the power of the interest groups��doctors, hospitals, insurers, drug companies, researchers, patient advocates��that have a direct stake in it. Rather than simply pointing out the major flaws and placing blame, Daschle offers key solutions and creates a blueprint for solving the crisis. ????? Daschle��s solution lies in the Federal Reserve Board, which has overseen the equally complicated financial system with great success.? A Fed-like health board would offer a public framework within which a private health-care system can operate more effectively and efficiently��insulated from political pressure yet accountable to elected officials and the American people. Daschle argues that this independent board would create a single standard of care and exert tremendous influence on every other provider and payer, even those in the private sector. ????? After decades of failed incremental measures, the American health-care system remains fundamentally broken and requires a comprehensive fix.? With his bold and forward-looking plan, Daschle points us to the solution. Tom Daschle, the new Secretary of Health and Human Services in the Obama administration, understands the health care problem. He "gets it" that millions of Americans do without the health care they need because health insurance is too expensive and, for many, unavailable at any price. He knows that Americans are driven to bankruptcy by their high medical bills, and he repeats in this book many of the horror stories I've heard before and many new ones as well. I am glad that he is listening to these stories. He is also aware that getting health insurance through an employer is a practice that no longer works for millions of Americans. He writes about the "increasing number of independent contractors, temporary employees, and part-time employees..." who do not qualify for employer-provided insurance. I have been one of those workers and I've seen the options shrink for anyone who is part of the contingent or self-employed workforce. Daschle has a good sense that an employer-based system cannot meet our needs. Nor, in my opinion, is it fair. Why should people who work for large, prosperous companies get better health care than someone who works for a neighborhood restaurant or does free-lance writing? Why should your employment situation determine whether or not you get health care? No other country on earth has such a system, and many American employers find it an increasing burden that puts them at a disadvantage in a global economy. Daschle gives us a summary of historic events that shaped our current non-system, including a few I didn't know. I didn't realize that Teddy Roosevelt made National Health Insurance part of his platform in 1912 or that the labor movement tried to get government-funded health insurance way back in 1914. It was opposition to this that led some employers to consider providing insurance to their employees. During the Depression years, hospitals tried to keep their beds filled by offering prepaid plans. These later evolved into the Blue Cross plans that originally were based on a social insurance model but later adopted the same practices as commercial insurance companies. The modern history of attempts to bring government-funded universal coverage to Americans begins with Franklin Roosevelt. He intended to give us universal health care in the Social Security Act, but, facing serious opposition, mainly from the AMA, he pushed the legislation through without the health care provision. It wasn't until the administration of Lyndon Johnson that we got Medicare and Medicaid. Dachle makes sure we know that he was involved in Bill & Hillary Clinton's attempts to reform health care in the 1990s. Our legacy is an unplanned, almost accidental, health care environment that does not serve the American people and is so expensive that, if costs continue rising at the same rate, health care will consume 100% of our income by 2025. Obviously, this is not sustainable. -- HOW DO WE FIX IT? While I'm satisfied Daschle understands the severity of the problem, I'm not sure he has a handle on the best solution. I do like his idea of having a national health board that oversees health policy and determines the details of how a reformed health care system should work. He compares this to the Federal Reserve Board which oversees banking and financial institutions. Of course, we now have a financial melt-down, calling into question how effective such boards can be. Any concept of having a group of experts deal with the details of running a complex system like health care or financial markets is subject to the expertise and ethical principles of those who serve on the board. But even with Congress just doing the broad strokes, a number of decisions must be made up front. Daschle does not suggest kicking out the insurance companies (who have failed us) and going with a pure government-funded, single-payer system. Why not? He mentions the Massachusetts plan in a favorable light a number of times in the book, but that plan still leaves large numbers of people uninsured, despite the "individual mandate" that all residents must buy insurance. People do not comply because they still can't afford the premiums or feel the skimpy coverage is not worth the price of the monthly premium. If you postulate a plan that says "we'll use private insurance, but we'll subsidize people below a certain income level" then you have to have some way to determine who qualifies for the subsidy. You have to create a bureaucracy to constantly requalify people based on their income. You have to make some provision for the fact that people can lose their income and it doesn't conveniently happen at one time of the year when policies come up for renewal. Someone with a job today can pay his premium, but next month when he's laid off, maybe he can't. How fast can you get him a subsidy? Insurance companies cancel people when they don't make a payment. Since peoples' circumstances can change, you will still have people jumping from one plan to being uninsured to another plan, back and forth. The lack of continuity in our coverage is a major problem with what we have, and why I don't buy the argument that "some people like what they have." Do they like that they can lose "what they have" as soon as they can't make a payment or lose their job? Why adopt a system that perpetuates this problem? Daschle also talks about expanding use of the Federal Employees Health Benefit Plan (FEHB), but he doesn't explain what this is except to call it "a menu of private health plans." If it is just more private insurance, how can it help us out of the mess we have now? It seems to me that if you polled the American people and asked if they prefer "what they have now" to a plan that requires no monthly payments and can never be taken away, you'd hear a giant whooshing sound as Americans rushed to Washington to demand such a system from their representatives. What is health security? Is it just being able to say "I have health insurance?" I may have it today, but I can lose it tomorrow. Real security is a plan in which you are automatically enrolled and from which you can never be cut off. A plan that offers continuity of coverage and of care, that does not require you to requalify or recertify to stay in the plan. It means never having to worry about being bankrupted by sickness. And, in my humble opinion, it also means never having to deal with an insurance company. They are in the denial business, taking your money every month, then doing their best to deny you care when you need it. Secretary Dashle, how can you support the concept "build on what we have now" when what we have now has failed us so badly and is so expensive it threatens our total economy? The insurance industry will lie, engage in deceitful tactics, and spend a fortune trying to keep "what they have now" - our money, for which they give us back as little as possible in so-called "benefits." Daschle has the audacity to call for the best-quality healthcare system in the world to be dismantled, and run by one of the worst-run organizations in the world, the US government. I wonder how most people would rate the effectiveness of the US healthcare system, vs. the effectiveness of the US Congress, of which Daschle was a key player? Daschle spends the first two-thirds of his book providing the reader with an informative and useful history of health insurance and health care reform efforts in the US, a necessary foundation for moving on to his proposals for reform. One of his core reform proposals is the creation of an independent Federal Reserve-like board for health care. This organization would opine on the cost effectiveness of various treatment modalities and drug therapies based on objective scientific research, data and experiential evidence, largely free of the politics and pressures that currently distort the system. He then moves on to the health care payment mechanism and, to my dismay, dismisses a single payer approach as politically infeasible and, for the same reason, retains employer based private plans in conjunction with a new federally sponsored system similar to what federal employees currently have available. Unlike Daschle, I believe that the country --- citizens, employers, health care providers --- is ready to give serious consideration to a single payer system offering multiple provider network choices (plans). I believe that this is the best way to reduce costs and assure a nationwide health records data system without compromising quality of care. Unfortunately, Daschle, in just half a page, almost disdainfully dismisses this approach as politically infeasible. Unfortunately, this book gets inspiration for its answers from Western Europe, particularly the UK. But the author seems unaware that the UK already has lower cancer survival rates than the US, higher waiting times than the US, less mri and cat scan machines per person than the US, less alternative treatment and second opinion options than the US, and less available dental care (and worse looking teeth) than the US. The only thing the UK has better than the US is overall life expectancy, but that is more due to US roads, crime, and diet than healthcare quality. What about the huge cost of malpractice insurance doctors and hospitals face? Look at the prescription drug plan that was setup for Medicare, it was to costly and difficult. It would be much worse for any gov't run health care program. Does the government have a role in health care - yes, but not to be in there as a wasteful bureaucracy trying to manage it. There is no comparison to banking as the Federal Reserve doesn't manage our bank accounts, they manage the total money and assets the banks work with. What would this be for the medical field - manage how many heart operations are allocated? "Critical: What We Can Do about the Health Care Crisis," by Secretary Thomas Daschle is an excellent introduction to the problems facing the American healthcare system. The history of US healthcare is well told, informing the reader how we arrived in the conundrum in which we find ourselves with a system based upon employment, being medically indigent, or over 65; but providing no support for those unable to afford the escalating costs of private health insurance premiums. Mr. Daschle argues for the creation of a Federal Healtcare Board (FNB) that would be distant from the political, partisan infighting that occurs within Congress and between it and the White House. His FHB would define the rules for the American healthcare system in the way that the Federal Reserve Board develops rules under which our financial system works. The members of the FHB would be professionals appointed to the Board for long terms by the President and Senate. They would not be politicians, but experts in medicine and the delivery of health services, asked to make decisions based on the science of prevention, medical practice, and administration. Presumably, the FNB would determine the services that would be covered under a federal universal system, and manage system resources. But Mr. Daschle does not define, adequately, how that system would be organized; how it would control costs, assure universal access, and guarantee that the quality of care is standardized, monitored, evaluated, and improved across the nation. Mr. Daschle rejects the idea of a single payer system, one similar to Medicare which now manages the resources caring for those over 65. The Medicare Trust Fund reimburses private medical providers, purchases drugs, and covers inpatient facility costs. Mr. Daschle ignores an important option modeled upon the 40 year success of Medicare. The Conyers Bill, HR 676 is legislation that would expand and streamline Medicare to include everyone in this country regardless of their working status, income, or age, under one public system. His failure to discuss a Medicare-for-All option, a public fund, purchasing care in the private sector, diminishes the value of Daschle's work. It is, however, excellent reading for those who want to learn about the roots of our system, its many current problems, and at least one idea for change. The work, however, does not provide a plan to assure every American their fundamental rights to health, access to quality healthcare, the freedom to choose their own providers, and the absence from fear that their next illness may produce destitution. The book should be read by everyone concerned about the American healthcare system, and its problems. Senator Daschle's book is surprisingly good. I award it 4 stars. The focus of the book is on several areas: (1) recounting of the politics of passing healthcare reform legislation in general (2) the reasons for the failure of the last federal government attempt at reform while Senator Daschle was in Congress in the Clinton Administration in 1994 (3) Senator Daschle's proposal for a Federal Health Board modeled on the Federal Reserve System. Senator Daschle and his co-authors do a good job in all three areas. The style is what I call journalistesque. That is the writing style is somewhat simplistic in that it mimics speech rather than good writing. Nonetheless the style permits easy and quick reading. Senator Daschle writes from his competency as a politician and as a long-term, influential member of Congress. Appropriately so, given that he is not a scholar or physician. The physician perspective is well represented by several books, such as Dr. Arnold Relman's book A Second Opinion, among several other good to excellent books on healthcare policy. The "journalistic" perspective is well-represented by Jonathan Cohn's book Sick and Maggie Mahar's book Money-Driven Medicine, both excellent. Needless to say, political - as opposed to knowledge-based or science-based - considerations will predominate in regard to any fundamental reform in the overall healthcare system, both in its financing and its delivery. As a consequence it is worth noting Senator Daschle's perspective. That encompasses a continuation of a "private/public" entities. Presumably, employer-funded private insurance will continue. The federal government would create the Federal Health Board - a concept which I agree with - whose functions would be (1) to insulate decision-making from the Congress to Congress "meddling" in minutiae by Congressmen and -women, a good attribute in my opinion, and (2) to act as a neutral decider/researcher on any number of reform initiatives from public financing proposals to changes in the methods of payment to healthcare providers to changes in medical service delivery to medical infrastructure investment to further development and implementation of electronic medical records. All good tasks in my opinion that need to be at least one step removed from day-to-day political considerations. Senator Daschle explicitly notes on page 144 "If passage of a single-payer system isn't realistic...", so presumably the desire of many physicians, patients and citizens to have such a system is thwarted. Senator Daschle further states on page 145: "So instead of creating a 'pure model', I believe we should build on the one that we have." Senator goes on to discuss many aspects of reform including expansion of the Federal Employee Health Benefits Program that covers federal workers and Congress to individuals not covered by a plan offered by their employer. He cites the need to pay medical service providers on the basis of "outcomes", a commonly recommended characteristic that has become a popular buzzword among politicians, who always seek to echo concepts that sound good, but which may in fact mean little. In this case, the efficacious measuring of outcomes of medical service intervention is a crucial aspect of improvement to the "system", but the reality of trying to create an accurate measure of outcomes is quite difficult, noticeably due to the inevitable lag time and indirect linkage between intervention and results. Poorly written with a lack of cohesiveness relying on disjointed numbers and typical political/big business influenced solutions of "more of the same". However, given Daschele's pending appointment, a quick insight into how he thinks, or doesn't. With the Obama administration now bringing healthcare to the forefront of political agenda, Critical is a must-read for anyone wishing to understand the issues being debated on Capitol Hill. Senator Daschle tackles the long-lingering problems of our national healthcare system, beginning with the roots of insurance a little over a century ago. In part one, Daschle describes the evolution of healthcare in the United States and how over time growing complexity has overloaded the payment protocols and systems established decades ago. Importantly, he describes which initiatives have worked, and why certain plans such as the failed Clinton-era reforms of the 1990s led to political disaster. Daschle does an excellent job pointing out the deficiencies in our current system, such as the misaligned incentives of an employer-based healthcare system. As is, employer-provided healthcare is a problem for the morbidly ill - the sick are unable to find work, which deprives them of the treatment necessary to return to health, leading to a vicious cycle. This is not only a financial burden on individuals, but a toll on the greater economy. Start-up companies with smaller pools of workers become challenged with the undue burden of exorbitantly rising costs. Entrepreneurs have less freedom to start new businesses due to the risks of not carrying health insurance. Another unintended consequence arises from our current managed care-based system - patients without insurance are charged much greater fees for service because they do not have the benefit of the negotiated discounts granted by a PPO or HMO. In addition to ideas such as the expansion of coverage using federal dollars, the crux of Daschle's cost-containment solution lies in a Health Board. This proposed Board will be a Federal regulatory agency capable of setting rules and standards for healthcare providers. It will set criteria for treatment, and break down the much-too-cozy relationships between industry suppliers and the physicians that deliver their supplies. The Federal Health Board will be a cross-functional agency, designed to cover a more encompassing jurisdiction than the FDA or NIH alone. While I applaud the Senator for effectively addressing America's healthcare problem and presenting a well-thought plan, however I personally do not believe a Federal Health Board is a panacea. A number of conflicts could still exist with a Health Board, especially if given unchecked power as suggested in Daschle's plan. With the federal government deciding the best practices for treatment, would this necessarily lead to better care for all individuals? Or would the Federal Health Board deny individuals better, but unproven treatments in exchange for more statistically econometric treatments to the payors? America is now caught in a bind between cost containment, and its thirst for more costly but more experimental sets of treatments. Well, Tom may not have gotten the head the Health and Human Services Department. Uh, yeah not paying taxes....not a very good example to set. I noticed some of his work in the new stimulus bill....Looks like his work...Here below is from the stimulus bill. This may bore some but this will affect everyone of us in the USA. This book is sound in its review of the history and science of need and opportunity for health care reform. 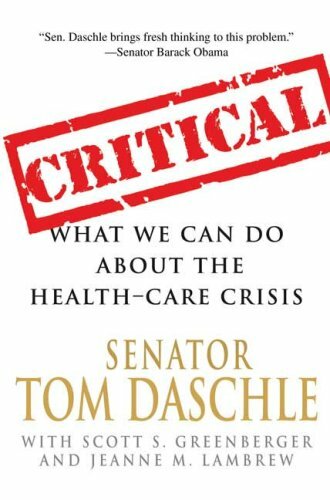 While our new Secretary of HHS,former Senator Tom Daschle knows how to relate to congress to get needed changes, this book shows he has a great fundamental approach to the use of government leadership as well as market forces to assure affordable and effective health care for all Americans. I have worked for almost thirty years to help the "marketplace" work in health care. This includes a ten-year stint in Detroit with the Auto Companies and UAW working for health care change. There is no way the market by itself can bring needed reforms. Senator Daschle provides a strong leadership perspective on how to combine the forces of market and government as relates to health care. This book practical,and clear in its message. It is highly recomended for anyone interested in health care and reform. Some say that the American health-care system is broken. Some say that it is the best health-care system in the world. Tom Daschle, in Critical, recognizes that something can be the best in the world and still be broken. In the land of the blind, the one eyed man is king. Furthermore, he realizes that regardless of whether or not the health-care system is working properly or efficiently, a significant amount of people are unsatisfied with it, enough for Daschle to take a long look into the history of the American health-care system and actually find some seriously appalling problems. Daschle offers a unique solution, one that walks the line between completely socialized health-care and completely privatized health-care. What he suggests is a public board, paid for and run by the government, that simply watches and regulates the health-care system. This isn't government administrated, all for one and one for all health-care - and it isn't die-hard every man for himself health-care, either. It's a feasible plan with a moderate amount of potential solvency, which makes Daschle's book, Critical quite critical indeed. The end of cutting edge health care. Tom Daschle wants to sell free health care to the American public. The idea that a national bueacracy will direct American health care is ludicrous. World wide, America is the place people come to get treated. Why? Because there is a plethora of medical professionals competing to be the best. Tom should have looked at auto insurance as a model for American health care insurance. Auto insurance was mandated for every person who owns or drives a car. The federal government did not dictate the extent of coverage, the purveyor of coverage or where one has car repairs done. Prices for auto insurance are affordable. Auto insurance claims are efficient, as is auto repair. No beauracracy has ever been called efficient. Furthermore, Tom will have a beauracracy decide if the treatment for an individual is worthwhile based on the outcome. It is no longer a decison between doctor and patient.